1. Preheat your oven to 230°C (210°C fan forced). While it’s heating, deseed and cut the pumpkin into 2cm-thick pieces. Lay the pieces on a tray, lightly drizzle with oil and season with salt and pepper. Roast the pumpkin for about 20 minutes or until tender. Once done, set aside and cool to room temperature. 2. Now you can place your McCain Ultra Thin Moroccan Lamb Pizza onto the middle shelf of your oven and bake as per the instructions on the packaging. 3. Gently toast the pine nuts in a pan until lightly golden and sprinkle over the baby spinach. 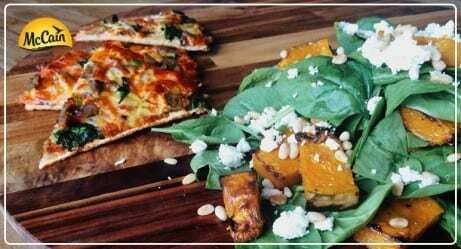 Crumble the feta over the leaves and add the roasted pumpkin. Toss gently, careful not to squash the pumpkin and dress with a touch more olive oil if needed. 4. 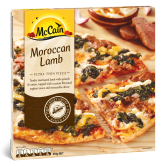 Serve alongside your yummy McCain Ultra Thin Moroccan Lamb Pizza. Delicious! 1 Preheat your oven to 230°C (210°C fan forced). While it’s heating, deseed and cut the pumpkin into 2cm-thick pieces. Lay the pieces on a tray, lightly drizzle with oil and season with salt and pepper. Roast the pumpkin for about 20 minutes or until tender. Once done, set aside and cool to room temperature. 2 Now you can place your McCain Ultra Thin Moroccan Lamb Pizza onto the middle shelf of your oven and bake as per the instructions on the packaging. 3 Gently toast the pine nuts in a pan until lightly golden and sprinkle over the baby spinach. Crumble the feta over the leaves and add the roasted pumpkin. Toss gently, careful not to squash the pumpkin and dress with a touch more olive oil if needed. 4 Serve alongside your yummy McCain Ultra Thin Moroccan Lamb Pizza. Delicious!